Full day training program with study materials and case studies, live demos and ample practice. 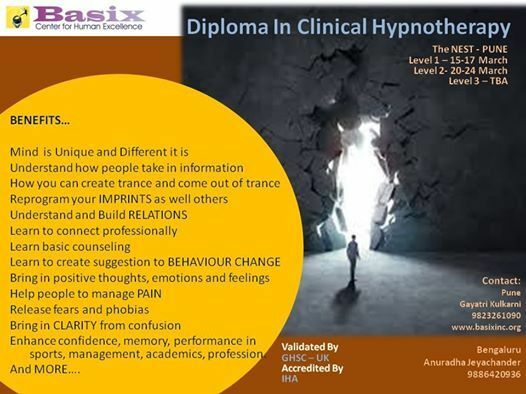 Hypnotherapy is a rapidly growing field and the demand for Practitioners is increasing exponentially all over the world. It is an invaluable tool for helping people achieve higher levels of personal and professional effectiveness in all areas of life. 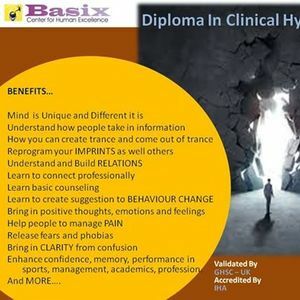 Become a better and more successful Hypnotherpist by taking in the first step by registering self for the upcomimg Level 1 and /or enroll yourself for full Diploma with great Early bird offer. Speaker, Manager, Sales and Marketing professionals, Business professionals, Entrepreneurs, Psychologists, Social workers , Spiritual preachers, professors and all who want to enrich your lives and want to enrich others too. You can also make a choice to build a career. As we all know that power of subconscious can make impossible possible join today and be a part of HYPNOSIS practitioners. Rush in your registration as We are currently offering this program at a very special price.